A close up look at the carvings on the side of Gladiator Stone of Moctezuma Ilhuicamina. 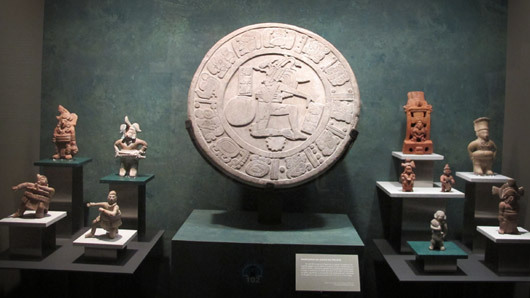 This impressive modern museum, visited by 2 million people every year, tells the story of Mexico from before the Mayan civilization to the Spanish conquest. In this episode, a chemical engineer and some Mexican athletes help us discover whether the rubber ball used on the ancient Mayan playing field contained a human skull. We dive into a watery cave to discover the Mayan path to the afterlife, then investigate the power of a crystal skull to reveal the secrets of the dead. We pilot an ancient canoe through Aztec canals to discover why modern Mexico City is sinking, then discover how a valiant gladiator defeated a score of Aztec warriors armed with the world’s sharpest swords. And finally, we discover how a dress worn by the most notorious woman in Mexican history led to a massacre that changed history. 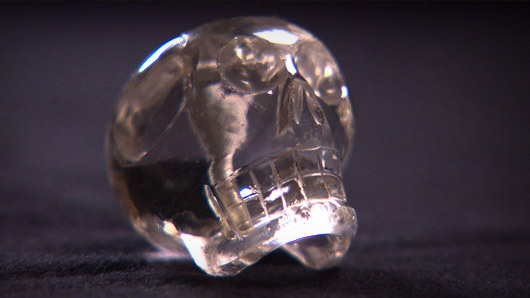 When rock crystal is carved into the shape of a skull, what mystic power is unleashed? How did a rebel who defied the will of an Aztec emperor kill 20 sword wielding soldiers with a stick while tied to an enormous disk of stone? When Mayan athletes played a popular game with a bouncing rubber ball, did the ball contain a human skull? What does an ancient canoe found beneath a downtown street reveal about why Mexico City is sinking faster than Venice? Who is the most notorious woman in Mexican history, and how did the simple native dress she wore change history? 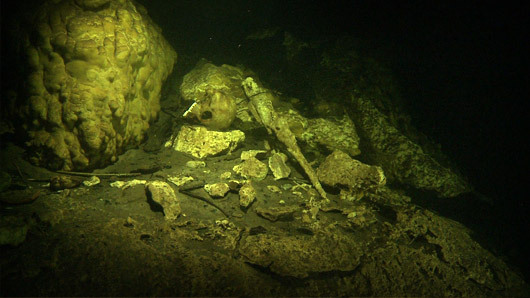 Throughout southern Mexico, why are so many ancient skulls found beneath the crystal surface of freshwater sinkholes called “Cenotes”?